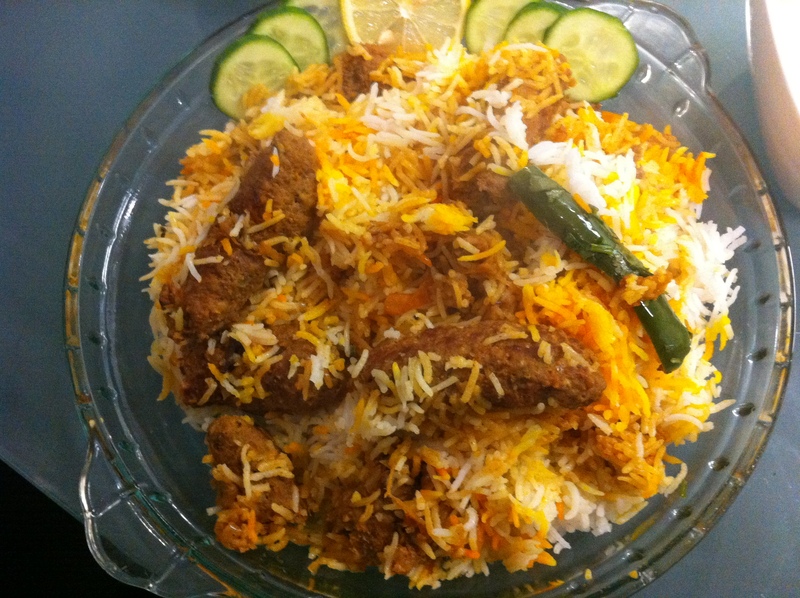 Kabab biryani is entirely my own recipe. I have used my culinary innovative skills to invent this recipe and believe me its mind blowing …. -Put all the vegetables, herbs and spices in the food processor and coarsely grind them. -Add mincemeat and gram flour and mix well. -Take this mixture out in a mixing bowl and make seekh kababs. 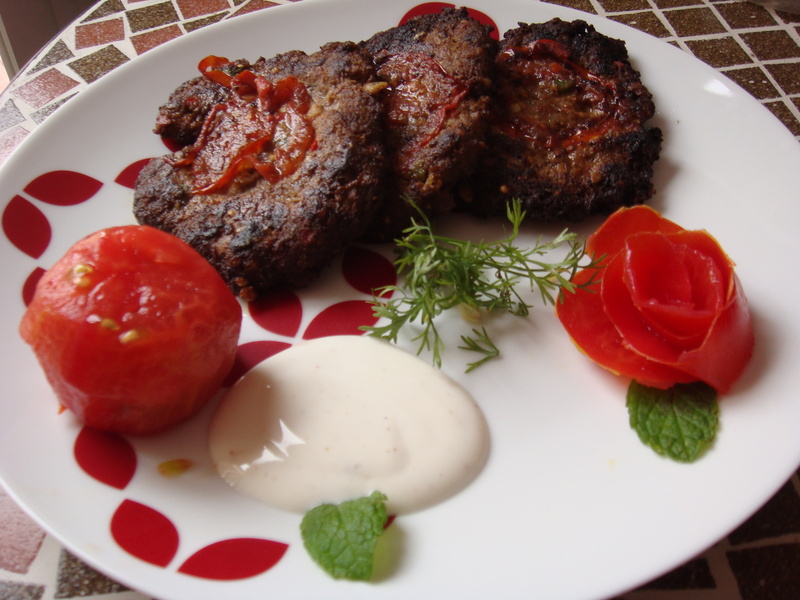 -Heat oil in a frying pan and fry these kababs until they are brown an firm. -Take them out in a plate and keep aside. -Now in a deep cooking pan (non – stick preferred), heat oil and fry whole garam masala. Add ginger, garlic paste and ginger juliennes and stir. Add onions and fry them until they are golden brown. Now add kebabs, tomatoes, biryani masala and yogurt. Stir once and then cook on low flame until the masala is formed. -Now boil water and add soaked rice. Boil until the rice are ¾ % cooked. -Strain, discard water and keep the boiled rice aside. -Divide boiled rice and kabab rice in 3 portions. -Meanwhile heat charcoal piece until its white and keep burning until it’s the time to use it. -Now in a deep cooking vessel, heat some oil and add curry leaves and green chillies, when they begin to splatter add one portion of kabab masala and spread a layer of one portion of boiled rice. Repeat the process until all the portions of kabab masala and rice are done. Make sure the rice is the last layer. 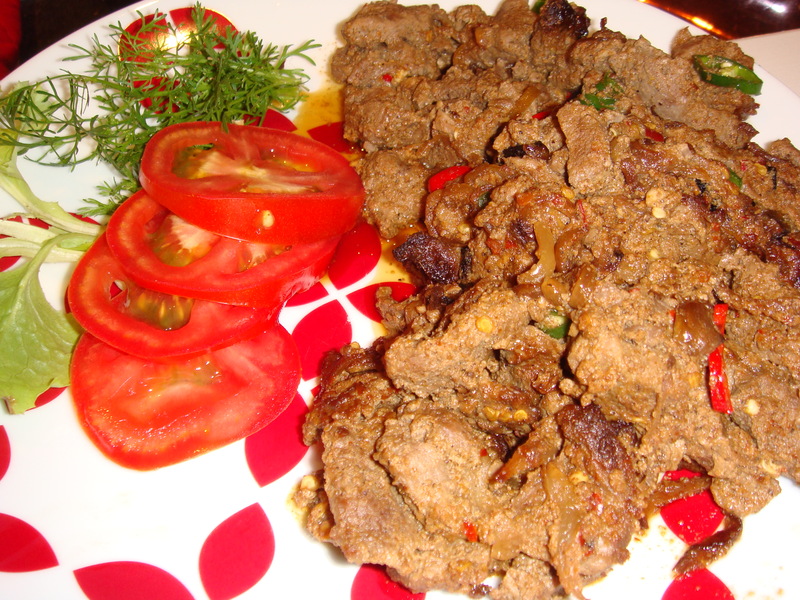 -Sprinkle coriander leaves, fried onion, lemon slices and yellow food colour. Now place the aluminum foil on it and burning charcoal on the aluminum foil. Drizzle some oil on charcoal and immediately cover the pot. Remove from flame and keep it covered for 15 minutes. -Remove charcoal and aluminum and serve. -Serve hot with salad and raita. For fried onions, heat ½ cup oil and fry onion slices until they are brown and firm. Drain oil thoroughly. -If you don’t have a BBQ grill at home, line a pan with aluminum foil and grease the foil with some olive oil. Put the marinated mixture in it and bake in preheated oven (160 degrees Celsius) for approximately 90 minutes. -If you have BBQ grill at home, thread the meat on the skewers and cook on very low heat until they are done. -Take your dish out on a plate and serve hot with garlic nan or tandoori roti.